Don't just improve your desk or table racing setup with other wheel stands on the market. 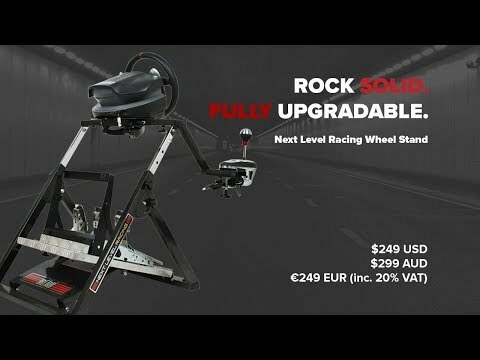 The Next level Racing Wheel Stand has been designed specifically to give you the full simulator experience. Our patended design not only looks fantastic but has an adjustable wheel height, puts your gear shifter in the most realistic position as well as an inclined pedal plate for your pedals which is also fully adjustable. - Folds away in less than 5 seconds, easy 1-step action! - Comes almost fully assembled so you can start racing in minutes. - Up to 10 minutes required to change from formula to GT position. Wheel, pedal and seat positions all change. - Next Level Racing GTUltimate Gaming Desktop – Need more room when gaming or using your computer or gaming console? Perfect for holding speakers, books, papers, phones, wallet, controllers, games etc. - Suits children from 6 years all the way to 7ft tall adults. - Tools included for assembly. Please note steering wheel, pedals and gear shifter pictured are for demonstration purposes only and are not included. I'm impressed by the heavyweight quality of this wheelstand. It comes with a ton of accessory parts for all sorts of scenarios like flight, driving and just gaming. Tools are included. One thing I'd like to see added is a 'dashboard' around the wheel mount. That would be sweet. I plan on making my own, along with a groovy cup holder. It’s rock solid when I use it, was easy to assemble and set up. It’s comfortable to use with no bar between my feet, so nothing interferes with the pedal action. It’s easy to fold up and put in a corner where it’s out of the way of my wife and child. Just received my next level wheel stand & surprised it came so fast as I only ordered yesterday afternoon. Fantastic!!! Looking forward to putting it together & having fun on the long weekend thanks to your prompt service Brendan (I think). All the best Kevin Skelton. If you already have a decent seat with good adjustments, then this rates more like 3.5 stars, as the cons don't bother me much (if ever). Those using cheap-o office chairs may have trouble finding a comfortable position, as nothing on the stand tilts - only extends/contracts. Pros - sturdy and stable steel construction ; wheel does not budge or loosen it's clamps one bit after ~2 months of use for about 1-2 hr/day. Fairly intuitive assembly. Cons - besides wheel-height and pedal distance there is no other adjust-ability, coupling of the shifter attachment not as tight as other parts (i had to DIY a shim to remedy), knobs for tightening are plastic, engrish-y assembly manual doesn't help much. Considering that it's the sturdiest stand under $300 by far that I could find, I'm willing to live with the shortcomings. This wheelstand works very well. It has sufficient adjustability, is surprisingly solid and yet still folds up when not in use. It has a few minor issues, like the plastic plugs which fell out of the extending arms and caused it to wobble, but this was easily fixed by retrieving them from inside the stand and gluing them back in place. Overall it's a very good unit, and with very quick delivery. Been using it for a while now and it is definitely way better than using a desk as this stand does not move at all and its fairly easy to move this stand and to set it up in different rooms as I enjoy sim-racing games on the xbox and PC. The only minor problems is that the piece that mounts the wheel to the stand was loose but a few washers fixed this problem and now its rock solid. Thanks Pagnian! Got sick of using my coffee table so thought I'd try this stand after seeing it reviewed on an American show which they had reviewed others and this got the best feedback.Well it's absolutely fantastic so sturdy easy to use which I had the room for the whole setup would love to have the cockpit,At least it's possible to add a seat hopefully when I get the room super quick delivery as well cheers guys. This stand is amazing. I bought it on a Wednesday night and received it Friday morning at my door. I was shocked to see how quick the shipping was and so I set it up right away. Set up was pretty easy although I did find that the holes to mount the G27 gear shifter were slightly out of align although this was an easy fix with a drill to just widen them a bit. I also had to remove the back clamp piece from the shifter so that it would fit on. All this was pretty easy though and once I had mounted everything, it was sturdy as. After using the stand for a week now, I can safely say that it is perfect. It is incredibly strong and rigid and nothing moves at all as everything is now hard mounted. The quality is amazing. I also didn't want anything too big for my room as I couldn't fit a full cockpit, but this stand folds up so that I can just lean it up against the wall. It's easy as to fold and unfold and it saves me having to plug all the cords in each time I go to use it. Overall I would have no problem giving this stand a 10/10. It does a much better job that clamping the wheel to the desk and it's easy to use and fold up plus heaps more sturdy than any other stands. Very much worth the buy! Super solid, Quality is way better than i thought absolute 5 star. This thing doesn't move it's rock solid, the design is awesome everything is fully adjustable and it folds flat with everything attached including the gear shifter. Only negative is that i purchased at full price and paid $299, my bloody luck! This is the first wheel stand I have ordered as I had always raced with my wheels connected to my desk. Well what can I say I am amazed at the different this stand makes to ones driving experience. You feel the force feedback though the stand even to your feet and since the wheel and gearbox is ( G25 though I have a fanatec CSR package on order from these guys) securely bolted to the stand they will not come loose at the worse place during a race which always happen when you play with your wheel connected to a desk. The Racing Cockpits are great but for me I just don't have the room but with this stand it gives you the best racing setup in a confined space. At $299 this stand is a steal and I recommend it to any would be racer out there that does not have the room or funds for the full racing cockpits also available from Next Level Racing though Pagnian Imports. Talking of Pagnian Imports their sales service is second to none. As soon as they have your order and recived payment they send the goods ( if in stock of course) and you do get it the next day and considering they do not charge for freight this is a amazing service. I highly recommend ordering your racing equipment though Pagnian Imports you will not be disappointed. I’ve been on the lookout for a cockpit, to hopefully improve my times, but definitely improve my overall enjoyment. I toyed with the idea of getting a model with an inbuilt seat but there’s both the high price and the size factor. I’ve got an L-shaped desk and I had just been clamping my G27 wheel and gear stick to that, with the carpet providing some resistance to nearly hold my pedals in place. 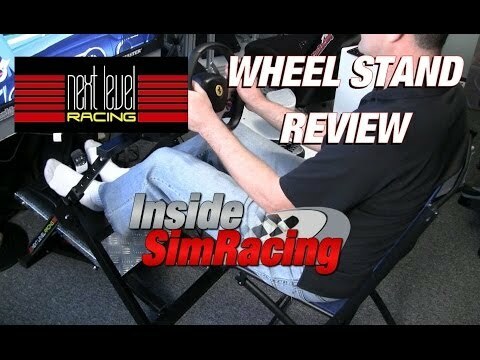 So after months of searching for the perfect stand (live in a shared apartment so simulator is out the question) i like what i saw with the Next Level Wheel Stand as it looked like a stable design. My main issues with other wheel stands was either having a single pole design which i have seen is very unstable and not as rigid as i would like. Also the pole between your leg is a pain for heel and toe when driving manual. Although i couldn't find reviews for the Next Level Wheel Stand i decided to purchase it anyhow as it had features that other stands didn't and i loved the look of it. Well i can say that this wheel stand is fantastic. It doesn't wobble like the other designs i had seen and this was my main concern with a wheel stand. The quick adjustability is great for when the mates are around and the sliding pedal plate is brilliant for adjusting distance of the pedals. I'm using the stand with a G27 and everything was pre-drilled for the wheel, pedals and shifter and even included the screws to hard mount them! Finally i was very impressed with the quality and it looks much better than a wheel stand ever has. Very happy with my purchase, i pre-ordered this along with a mat for it and i can say it was definitely worth the wait! Hopefully this review helps others as i couldn't find any reviews myself when purchasing as it was a new product.